He’s as solid as can be in the middle, will the scouts notice? The NFL Draft starts tomorrow night with the first round before Friday night’s second and third rounds air on ESPN. We’ve been looking at some of the guys that’ll be in the mix to be selected and make pro rosters, and now after two wide receivers, we head back to the defensive side of the ball. When you mention Dontavius Russell, he may not get the highest pub, but there’s certainly a muscle in Jake Fromm’s back that spasms with pain. 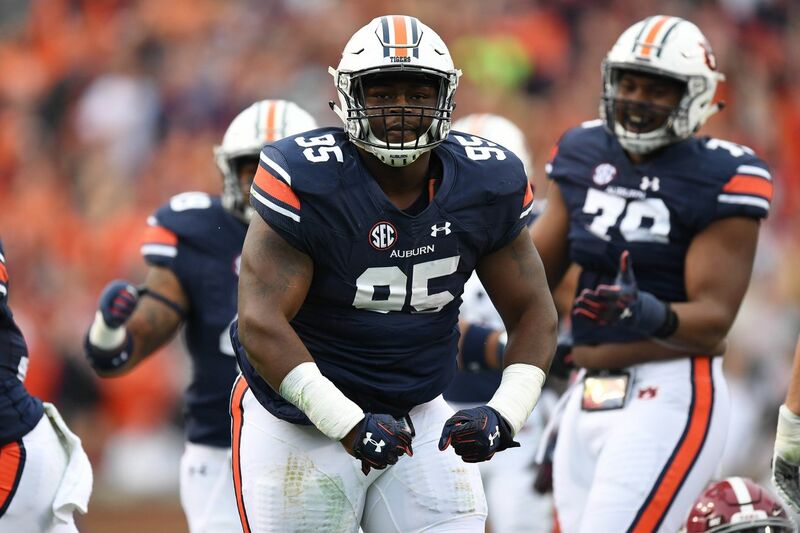 A four-year starter at Auburn, Russell became the consistent quiet cog in Rodney Garner’s defensive front. He played in 50 games during his time on the Plains, including 12 as a freshman, before turning into one of the key pieces on the line. With guys around him like Montravius Adams, Derrick Brown, Jeff Holland, Marlon Davidson, and Nick Coe, he was never going to be the flashiest guy on the field. He wasn’t going to be the one making sack after sack and blowing plays up. Russell’s job was to occupy blockers, stuff the holes, and allow everyone else to make plays. He was fantastic at that, and it may end up giving him the best chance to be the first Auburn player off the board. Anybody that watched Auburn’s defensive line this year knew Russell, but they wouldn’t see him make many plays that show up in the stat sheet. Like Cole Cubelic said in the video above, he wasn’t going to stand out that way, but he was going to allow everyone else to stand out that way. His size is great, and at 6’3, 319 pounds, he’s got some room to grow horizontally to help fill more of a gap on a professional defensive line. That’s exactly what the analysts think when you look at his draft profile, which gives him a “better-than-average chance to make NFL roster” , but does have suggestions for improvement. They think that Russell’s biggest bugaboo is his natural inclination to play too upright. Off the snap, he’ll often pop up instead of hitting down low to get leverage, and that’ll neutralize him immediately against a season NFL guard. In addition, there are a couple of small fixes, like inconsistency with hand usage, and a tendency to go hot and cold when it comes to moving through blocks. However, it’s impossible not to like his size. You can’t teach that, and he’s got room to grow. He’s also a guy that can cause havoc with one victory along the line. We all saw it plenty of times where the running back had to bounce outside because there were bodies strewn across the ground in front of him due to Russell blowing the interior apart. He wouldn’t make the tackle in that situation, but he was the root of the cause for someone else to finish the play. When you’ve got a good head on your shoulders and you’re a hard worker like he is, the chances to succeed rise. Cole Cubelic thinks that he’ll be a mid-to-late second rounder, which may be a little optimistic. Others think of him as a late-rounder, or a priority free agent. Unfortunately, there are a ton of good defensive tackles available in this draft class, so that may be the biggest hit on his draft stock. Overall, I think that he’ll be a guy that finds a spot late in the draft and sticks with a team for a while because of his work ethic and tendency to do the dirty work on the interior. Van and John continue their massive miniseries on modern Auburn Football with a look at the 1989 “First Time Ever” Iron Bowl in Jordan-Hare Stadium and the final years of the Pat Dye era. With a high of 81F and a low of 58F. 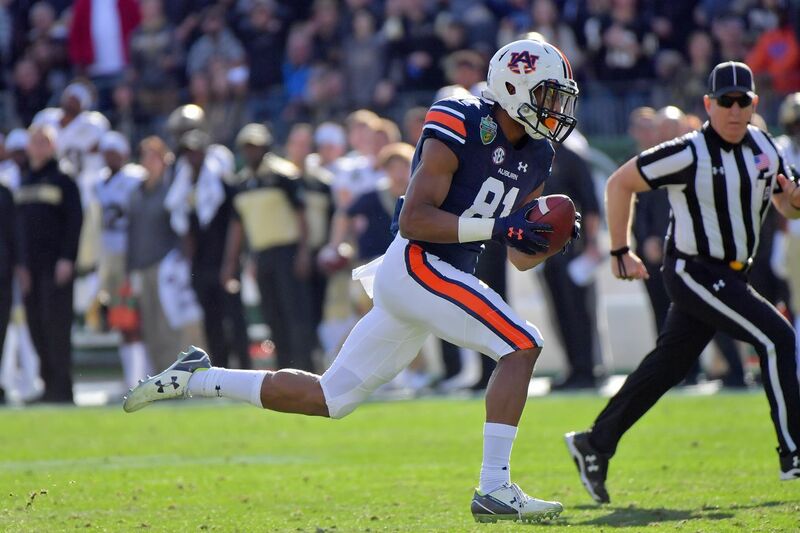 Today we continue our look at Auburn’s draft-eligible prospects with another wide receiver. This time, it’s the guy who single-handedly destroyed Purdue in the Music City Bowl as he blazed by slow Big Ten defenders with ease. Those catches essentially highlight the skillset of Darius Slayton. Blazing speed? You got it. 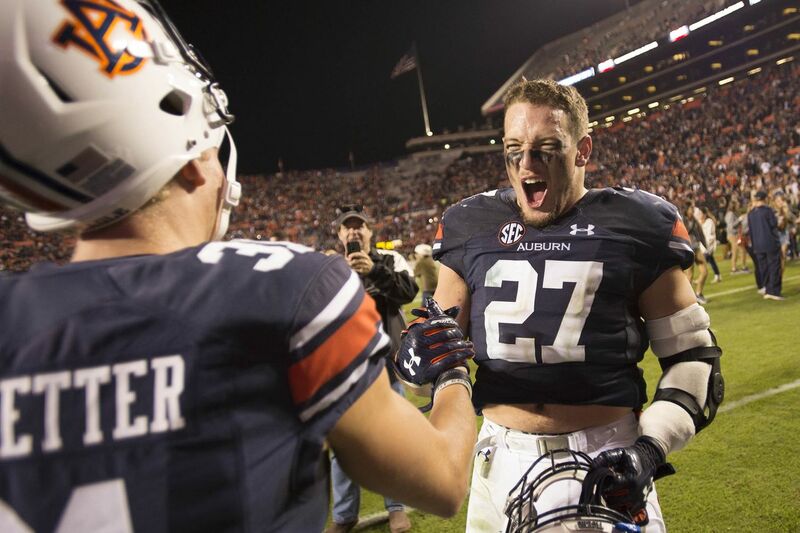 Slayton’s 2018 wasn’t as good as his 2017, and I believed that he would benefit from another year at Auburn, but he decided to test things out in the NFL Draft. In his first full year as a starter, Slayton grabbed 29 passes for 643 yards and 5 touchdowns (an incredible 22.2 yards per catch). He did see more action this past season, catching 35 passes for 670 yards and 5 touchdowns, but he wasn’t nearly as efficient. That’s partly his fault and partly the fault of the offense, as the entire attack suffered. Still, Slayton had a case of the dropsies at times in 2018. Again, we see the effect that Gus Malzahn’s offense has on his players in the eyes of the professional ranks. It didn’t seem to hurt Cam Newton. Either way, Darius Slayton showed off at the combine with a 4.39 40-yard dash, and the lasting image in everyone’s minds aren’t the drops, but the touchdowns against Purdue. He finished his college career with a 160-yard, 3-touchdown day in the bowl game, and we’ll see how he’s able to cash in on that. Right now, he’s projected to be a late-rounder, so we’ll see if somebody grabs onto the kind of player that can take the top off of a defense at any level. NEW EPISODE ALERT: Orange and True Podcast Presented by Sonic Tools! This, uh, ain’t your typical episode. Well, basketball season is over, football spring practices are done, A-Day has been completed, and we know that Crow doesn’t know enough about baseball to give any sort of real update on how Butch Thompson’s group is doing. What we do know is that AU Chief has the time and the know-how to rank EVERY SINGLE ONE OF THE MOVIES IN THE MARVEL CINEMATIC UNIVERSE. I believe officially there are 21 films, and Chief has the ranking on all of them. 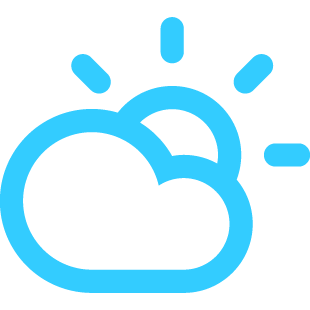 With a high of 82F and a low of 59F. The most prolific pass-catcher in Auburn history now looks ahead to his NFL prospects! As we continue with our NFL Draft profiles, it’s time to look at the man who caught more passes than anyone else in Auburn history — Ryan Davis. The stats speak for themselves. Davis found his niche and hit it hard with Jarrett Stidham tossing the ball. The pair combined for 155 receptions over the past two seasons, with Davis snagging 178 for his entire career for 1,555 yards and 7 touchdowns. Now, it’s true what the stats say — Davis was never the deep threat. He was always going to be the guy in Gus Malzahn’s offense (or Chip Lindsey’s, I guess) to catch the screen and make something happen with his shiftiness. His quickness allowed him to give Auburn a seemingly automatic 7-8 yards on each play. By making the first man miss, he was able to turn some of those catches into big hitters, and he was instrumental in wins over Georgia and Alabama in 2017, as well as the comeback against Texas A&M in 2018 due to his skills. Check out the two plays here against the Bulldogs in 2017. He’s not going to blaze by you like Darius Slayton might, but you’re not going to get a direct hit and you’re not going to be able to get two hands on him without help. Here’s a punt return and a huge touchdown against UGA. Now here he is showing off in the comeback against the Aggies last year. Not to mention that Davis also has some passing chops, and Auburn used him in trick plays, with 3-4 passes going for touchdowns in his career. That probably won’t get him any looks in the NFL, but his ability as a return man certainly won’t hurt. Davis averaged 10.8 yards per punt return in his career, and he only became the primary punt return man in 2018, taking back just two kicks before that time. He can show off the same quickness in those situations as he does in the passing game. As for his strengths, his NFL.com profile highlights everything that we’ve talked about — quickness, shiftiness, ability to make defenders miss. Unfortunately, Davis will need to work on some things to become the type of receiver the NFL covets. One of the main things may be the utter disdain that pro analysts have for Gus Malzahn’s offense. As you can see on the previous link, the first three knocks on his game stem from the fact that he caught a bunch of screen passes and wasn’t asked to do much else in the offense. When it comes to actual physical weaknesses, they’re pretty small. His hands can improve, and he can become a more fluid runner, but he should be able to find work in a training camp somewhere soon. A versatile blocker, Cox can find a role for himself helping just about any offense in the NFL. Over the next few days before the NFL Draft hits, we’ll be looking at some of Auburn’s best pro prospects! Today we start with a guy that helped seal things together for the Tiger offense ever since starting as a true freshman back in 2015! Chandler Cox is one of the higher-rated blocking backs coming out for the NFL Draft this season, due to his prowess paving the road and his ability to make catches out of the backfield. Over the course of his four seasons on the Plains, Cox snagged 26 passes for 237 yards and a touchdown. He figured into the offense more in that role than as a ball-carrier, as his primary job on running plays was to open the holes for Kerryon Johnson and Kam Pettway. He only carried the ball 11 times for 18 yards and 3 touchdowns in his four years, but Auburn’s rushing offense relied heavily on his ability to take on large defenders at the point of attack. Now, as he heads into the NFL, he’ll have an opportunity to either block for backs in that traditional sense, or provide protection for a quarterback in a pass-first offense. The fullback position is one that’s interestingly enough been beneficial for NFL teams despite a huge shift toward more passing on offense. Of the top ten rushing teams in the NFL, most of them employed a full-time fullback, and certain teams that really relied on the rushing game had two (Oakland) or even three (Kansas City) fullbacks on the roster. Cox is certainly capable of turning into a key piece of the offense no matter if they run a more wide-open spread attack, or a classic two-back offense. In either situation, the fullback is a versatile piece of the puzzle. Like we said above, Cox isn’t the traditional neck-roll guy that’ll body up to a linebacker. He’s able to provide a safety outlet for the passing game, and he’s able to help protect the quarterback in a spread offense while acting as a durable back that can catch or run. H-backs in the NFL have become en vogue over the past couple of seasons for the reason that they can help to fool defenses and give little time to adjust. Now, he may need to get a little bigger and stronger to have a chance to become a full-time NFL starter, but if he can do that, he’s got the right temperament and intelligence to thrive in the League. However, it’s telling that on Patriots.com, they’ve got him listed as one of their running back prospects. The accompanying video shows that Cox has experience in a scheme quite similar to some of the things that Tom Brady likes to get into up in New England. Have you ever watched something grow up right before your eyes? If you were at Plainsman Park this weekend or were watching on the SEC Network+, you got to see it. For 28 innings this weekend Auburn battled, scratched, faultered, improved, regressed and succeeded. Such is life in the SEC, just when you think you know whats coming one weekend, the rug is yanked out from under you and you are shellshocked one way or the other. This time though the shock is one to be proud of and should not be taken lightly. Game one started as many would expect. Garrett Wade had flashes of brilliance but also had growing pain moments, trying to start a double play at second and over throwing Will Holland and then throwing Rankin Woley off of 1st to extend innings for the Rebels and allowed them to take 4-1 lead in to the 3rd inning. That was all the Rebels would do though, thanks to the arm of Richard Fitts who was dominant, going 4.1 innings of 4 hit, 4 strikeout baseball and giving the Tiger offense time to get it in gear against Will Ethridge. Auburn was able to cut the lead to 1 in the bottom half of the 3rd and then took control in the 6th as Steven Williams sacrificed Scheffler in from 3rd. The Tigers added runs in the 7th and 8th, including this absolute bomb from the Mountie. Buh-bye. @edouardjulien7 gives us a little cushion with his 8th bomb of the year and 4th RBI of the game. The Good Friday matchup was anything but for Auburn as Ole Miss had a fantastic game plan that they executed to perfection against Tanner Burns, who didn’t have his best stuff on the evening. Burns battled however, going 5 innings giving up 3 runs on 7 hits with 3 walks and 7 strike outs. Elliott Anderson was also stellar going 4 innings and only giving up 2 runs. The offense was there, getting 3 solo home runs on the evening but couldn’t get men on for those blast shots and Ole Miss secured the 5-3 win. The rubber match saw Brooks Fuller again have a great afternoon except for 2 pitches. A solo blast and a 2 run shot off the bat of Grea Kessinger were the only runs Ole Miss could produce off the Tiger freshman as he went 4.2 innings of 5 hit, 6 strike out ball on the day. Jack Owen came in for relief and was better than could be hoped as we went 2.1 innings with a walk and a strikeout to his name. On the offensive side, Auburn was able to load the bases in the 3rd and that’s when the Mountie, who went 0-fer Friday, stepped to the plate. Clear 'em! @edouardjulien7 smokes one off the wall in LF and all three runs come in to score. At the time, it gave Auburn a 3-1 lead that was cut to 3-3 after the 2nd Kessinger HR. Fast forward to the 7th when Ryan Bliss let his bat be heard from. Big-hit Bliss. @ribliss2 comes thru with the go-ahead RBI single up the middle! Auburn would bring in the Bull who would have no trouble in the 8th but would give up a lead off HR in the 9th and would also give up a run in the 10th to make it a 5-4 game going to the bottom half against Preseason All-American Parker Caracci from Ole Miss. The Tigers would end up loading the bases with no one out. I will let the highlights do the rest of the talking. It was a wild one at Plainsman Park. This was a massive series win as the Tigers keep pace in the log jam that is the SEC West. 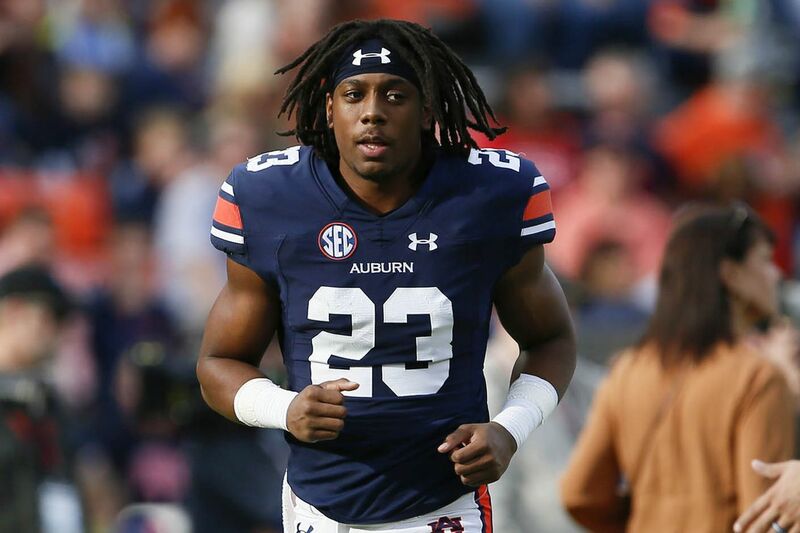 Auburn finds itself 2 games out of 1st place in the Division and 3 games back from the overall 1 seed, and if you didn’t notice, the first of Auburn’s two injured starters is back, with the other one marked to return in 2 weeks. The road ahead is still very dark and full of terrors, but the confidence boost from this weekend couldn’t have come at a better time. Normally, I like to choose a pitching performance in which the Tigers get a win, which definitely makes sense. But this week I think Elliott Anderson was the forgotten man in the Box Score. Anderson went 4 innings, giving up 4 hits while striking out 5 and giving up 2 runs which gave the Auburn offense time to try and figure out the Ole Miss pitching staff. Though that went for naught, it also saved the Auburn bullpen from having to go deeper than Steve Smith and Butch Thompson wanted to. Notice on Saturday during the 10th inning, Auburn had both Carson Skipper and Ryan Watson warming in case Cody got in to further trouble. Auburn never had to go to them because of the effort of Anderson and Thursday with Richard Fitts who was just as good as Anderson the night prior. I mean, do you have to ask? Conor Davis has been my surprise of the season so far. He’s always had the talent to be big in games (see the series clincher against South Carolina 2 years ago) but had struggled with inconsistency. This year, however, Davis has busted through and has been one of the Tigers more reliable bats, and a power bat at that. While the line for Davis this weekend isn’t jaw dropping, inside the line is where Davis did his damage. Conor went 3 for 12 this weekend with 2 HRs, a walk, 3 runs scored and 3 RBIs. It’s not about how many hits you have, its when you put the ball in play. 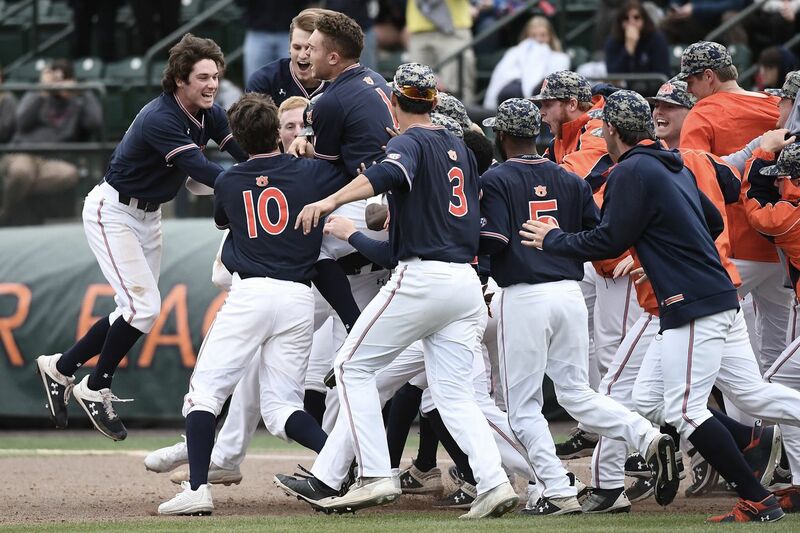 As long as Conor’s bat stays hot, Auburn’s lineup from 1-9 can be very dangerous, and it will be interesting to see how they look this week with that confidence boost from this series win.